Catherine Spong, M.D, ’91, selected as the UMKC Alumni Association’s 2012 Alumna of the Year, presented a lecture at the School of Medicine at noon on April 27 in conjunction with the School’s 40th anniversary celebration that weekend. Spong, chief of pregnancy and perinatology at the National Institutes of Health since 1996, spoke about obstetrics trials and their effect on practices. Spong discussed trials and studies that have stopped a practice, identified new therapies and treatments, and come up with evidence supporting a practice. Recognized by her peers as one of the most influential women in obstetrics and gynecology today, Spong works at the Eunice Kennedy Shriver National Institute of Child Health & Human Development. The University recognized Spong and the other 2012 Alumni Award recipients at the Alumni Awards Celebration on April 26 at the Westin Crown Center. The Alumnus of the Year Award recognizes a university-wide alumnus who has achieved eminence in his or her professional field, made contributions to education, science, the arts or human welfare of national or international significance, or rendered outstanding service to the community. 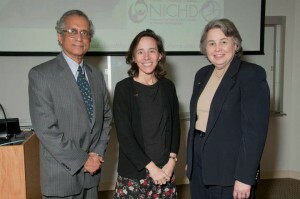 Dev Maulik, M.D., professor and chair of the Department of Obstetrics and Gynecology (left) and Dean Betty Drees, M.D., (right) join the 2012 UMKC Alumna of the Year Catherine Spong, M.D., ’91, during her lecture at the School of Medicine on April 27. Spong oversees nearly $100 million in research grants related to maternal fetal medicine, neonatology and obstetrics at the NIH. She also serves as the program scientist leading a network of 14 sites across the United States in clinical trials related to high risk pregnancies. Under her direction, the network has made a major breakthrough in reducing the risk of preterm births. “In the future, we should continue to build evidence so that we can give the best practice of medicine to our patients,” Spong said. The UMKC Alumnus of the Year Award is the University’s highest alumni award and given to honor excellence in one’s professional field and outstanding service to society. Past School of Medicine alumni to receive the award include 2008 recipient Robert Arnold, M.D., ’83, and 1991 recipient David Hayes, M.D., ’76.